Did you ever notice how closely meteorologists and hurricane forecasters watch the barometric pressure in hurricanes and tropical storms? There is a very good reason for their concern: the lower the barometric pressure, the more intense the storm. While we armchair weather watchers tend to focus on the category designation of a cyclone or the highest wind speed, weather specialists know the pressure indicates whether a hurricane is weakening or strengthening. We generally think of air as being weightless. That’s not true. The gases that make up our atmosphere do have weight, since the Earth’s gravity pulls at the atmosphere. When acrobats climb in higher and higher tiers, the man at the bottom of the formation feels greater and greater weight. So it is with air. The outer atmosphere places pressure on the gas molecules closest to the Earth, compressing the air at the bottom with its bulk. Air’s gas molecules are squished closer together, making the air denser and heavier. Air pressure, also called barometric pressure, indicates how the weight of the atmosphere above is shifting. A falling air pressure generally means an approaching storm in the next 12 to 24 hours. The farther the barometric pressure drops, the more intense the storm. Air pressure is measured with a barometer. Barometers typically use a column of mercury in a glass or a coiled tube to measure air pressure. A barometer measures in units called millibars, meaning the atmospheric force exerted on one square meter of surface. As terrain rises above sea level, the barometric pressure falls as the air’s gas molecules become less dense. Scientists consider 1013.2 millibars to be the normal air pressure at sea level on a calm day. Meteorologists gauge not only the intensity but also the cycling of a tropical event by the drops or rises in air pressure and wind speeds. If the pressure increases, the hurricane may be losing strength (or going through a cycle of reorganizing). If the pressure drops, the storm is gaining strength and wind speeds. A “low-pressure system” refers to an area with barometric readings lower than the area surrounding it. Low-pressure systems generally produce high winds, warmer air, and atmospheric lift— ideal ingredients for a tropical storm. The lower the barometric pressure in hurricanes, the higher the wind speeds— and the more dangerous the storm. In 2005, Hurricane WILMA reached the lowest barometric pressure ever recorded in an Atlantic Basin hurricane: 882 millibars. Her 185 MPH sustained winds attest to the ferociousness of this storm. In 1988, Hurricane GILBERT reached an air pressure low of 888 millibars. In 1935, scientists recorded a low-pressure reading of 892 millibars in the LABOR DAY Hurricane. Hurricane ALLEN clobbered Texas in 1980, after plummeting to 899 millibars. In 2005, Hurricane RITA, which inflicted major damage in Texas, sank to 895 millibars at its lowest point. Also in 2005, Hurricane KATRINA wreaked havoc on New Orleans and the Gulf Coast having reached a barometric low-pressure reading of 902 millibars. 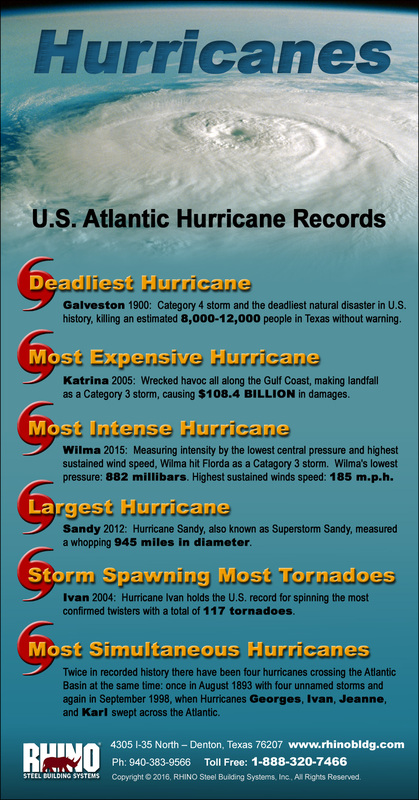 When KATRINA made her second landfall, she still registered as low as 920 millibars. Hurricane CAMILLE also reached a low of 900 millibars in 1969. In 1992, Hurricane ANDREW decimated Florida, making landfall as a Category 5 storm. The lowest pressure reading of the monster storm fell to 922 millibars. South Texas is still in the cleanup stages after Hurricane HARVEY smashed into the Lone Star state at 938 millibars of pressure. In 2012, Hurricane SANDY, dubbed “Superstorm Sandy” because of the sheer mass of the storm, recorded a minimum barometric pressure of 940 millibars. As this is posted, Hurricane IRMA’s lowest barometric reading has been 914 millibars, with sustained winds of 185 MPH and wind gusts up to 225 MPH! As of this moment, IRMA’s air pressure stands at 925 millibars and sustained wind speeds have dropped to 155 MPH— just below a Category 5. IRMA remained a Category 5 hurricane longer than any other storm on record. Clearly, the devastating effects of recent hurricanes will demand stronger building codes and stronger structures. RHINO Steel Building Systems stands ready to meet that challenge. Our pre-engineered steel framing is guaranteed to meet or exceed all current local building codes for the lifetime of the structure. For more information about RHINO-tough steel building products, call us today at 940.383.9566. Share the post "Understanding Barometric Pressure in Hurricanes"